Hi friends! It's almost Friday, wooo!! Yesterday E had his very first solo court appearance as an attorney, and it was my first day at a "new" job. (More on that to come.) We went out to a celebratory dinner and this is what I wore, plus my gray utility jacket for a little added warmth. While this may not be the most flattering sweater, I love it. It's super cozy, and I love the barely-lavender color. I sized up 2 sizes from my usual size so it's nice and slouchy, and long enough in the back to pair with leggings for the ultimate cozy-casual look. And today is linkup day! You are so rocking that pretty pink chunky knit!!! Congrats on your new job! I love this oversized sweater on you. Gorgeous look! I am loving the knit :) Oversized is totally my style too! Congrats to you 2, such a classic look I love it! Congrats on your new job! Love this casual look! That sweater looks so comfy! This sweater is beautiful, and looks perfectly cozy! Totally classy and cozy! LOVE! Please come join my link up party tomorrow FUN FASHION FRIDAY! Every Friday @ http://fashionshouldbefun.blogspot.com .... share your FAB with us! love this cute and cozy look! Congrats to both you and your husband on new jobs/roles! That's exciting. I love that sweater--it does look so cozy, and I think it looks great too! Thank you for hosting your great link-up! Love the outfit! Great neutral sweater! Your hair looks amazing!!! I love your outfit! The sweater looks great with the pants and booties. I'd like for you to join my blog link up, Trendy Wednesday! Love the sweater! 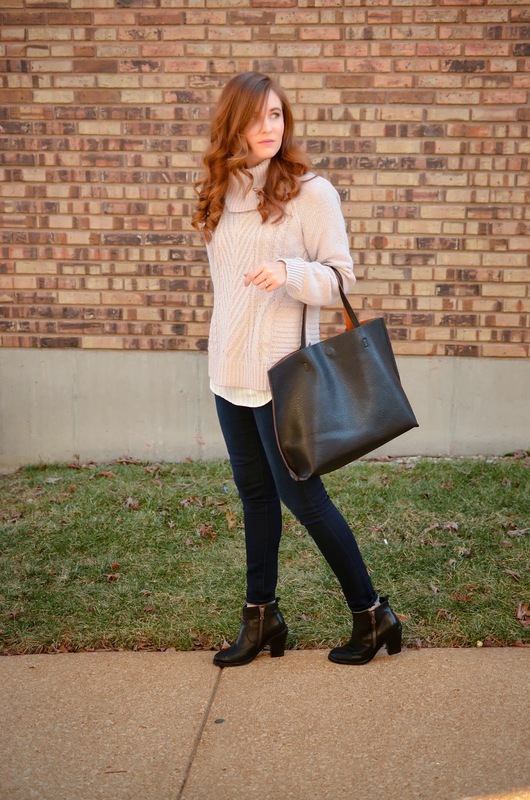 I've been into slouchy/long over skinny jeans + ankle boots lately, though my husband seems to think it's not the most flattering... oh well, I think it's cute and cozy for winter! This one looks great layered with a blouse. That sweater is fantastic- love the slouchy cowl neck, looks oh so cozy for the cold winter! Oh and the pup? Adorable. That sweater is perfect!! But I love love love the PUPPY!!! Thanks for hosting! I absolutely love your booties and how you layered your sweater! So chic and LOVE your perfect curls! Very cute and classic sweater. Kohl's has been my go-to place lately! I love the simple colours in this outfit. That sweater is amazing! So comfy and the knit is beautiful. Great boots too! I also really love your bag, I need to invest in a grownup bag just like it!